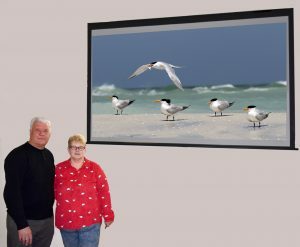 It was probably a lot warmer in Florida than in Grindleton on Tuesday night, but nature photographers Kitty and Geoff Walsh brought their own warmth with them. Members of the Chorley Club, their photography was of the highest quality, National Geographic magazine having publishing a number of their photographs. They were a little reluctant to visit Florida at first but are now regular commuters. The best time is December and January for the arrival of the migrating birds; April and May are the months for nesting. However the otters, crocodiles, racoons and many other animals are around at all times. However, the sun is too hot in the summer months for comfort. February starts with folios from the Inter-Club Photographic Alliance and the Lancashire and Cheshire Photographic Union. The club meets at 7:30 on Tuesdays at the Grindleton Pavilion. Photographic enthusiasts are invited to come and see what the club does before deciding to join. The club meets at 7-30pm in the Pavilion at Grindleton every Tuesday evening (except Halloween) from September 12th to May 8th.